Wealth-Lab owes to C# for the power of extensibility and ability to express trading rules of any complexity. However, its strong point is also that no programming may be required to "wire-frame" a trading system idea. For the exit repeat step #2 with an opposite Z-Score value. Figure 1. 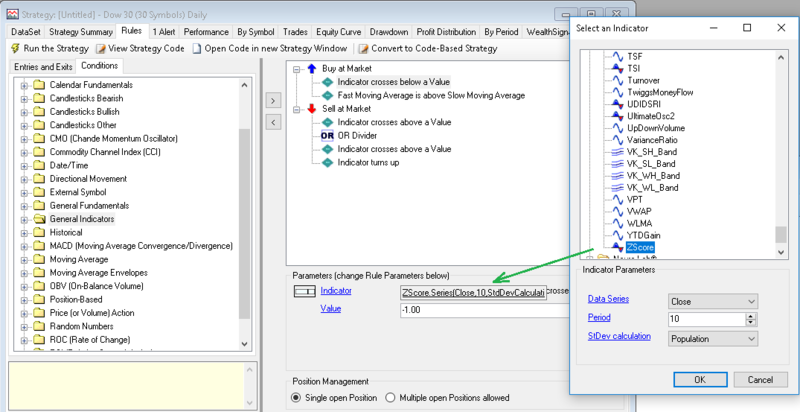 Creating a mean-reversion Strategy in the Rule Wizard. There's one more exit rule in author's Python code which liquidates positions if Z-Score flips from positive to negative or vice versa without going through the neutral zone. As shown on Figure 1, implementing it is a matter of dropping an OR divider with a couple of extra conditions below it. If everything's done right your trading system will generate trades similar to those on Figure 2. Those of you who prefer C# to take complete control will find a sample Strategy code below. Bottom line: the advantage of Wealth-Lab over software packages that require coding is that we can come up with a mean reversion system like the one presented by Anthony Garner in a minute of our time. //a z-score of over +1 triggers a sell and a z-score of less than -1 triggers a buy.